In the interim between the honorable mention picks and my top 15, let me take a break for a couple of reviews. This weekend has a couple of interesting movies on the horizon, but really nothing that grabs my full attention. Contraband, the Mark Wahlberg flick, is sitting at 59% on RT and some of the Top Critics have some decent things to say about it. I figured it was a throwaway January release, but maybe not. The Iron Lady, starring Ms. Meryl Steep is getting great critical reviews for her performance, but sits at a paltry 56% fresh. Yes, I am sure she will build onto her ridiculous tally already of 16 Academy nominations. But for my taste, love, I think I will pass. Margret Thatcher was quite a gal, but I think I'll run a twofer on this and The Queen some night on home video. Aching for a little nostalgia? Revisit 1991's Beauty and the Beast...brought to you in remastered 3-D. I like the concept of the production of Beauty and the Beast, because it was one of the last movies that starred relative unknown (to the public) voice actors in the two lead roles. From there it was all Billy Crystal, John Goodman, Albert Brooks, Owen Wilson, and Ray Romano. Who the heck are Paige O'Hara and Robby Benson...head to the theater and take a listen...it's impressive what voice actors can do and they are really being pushed to the side by star power. 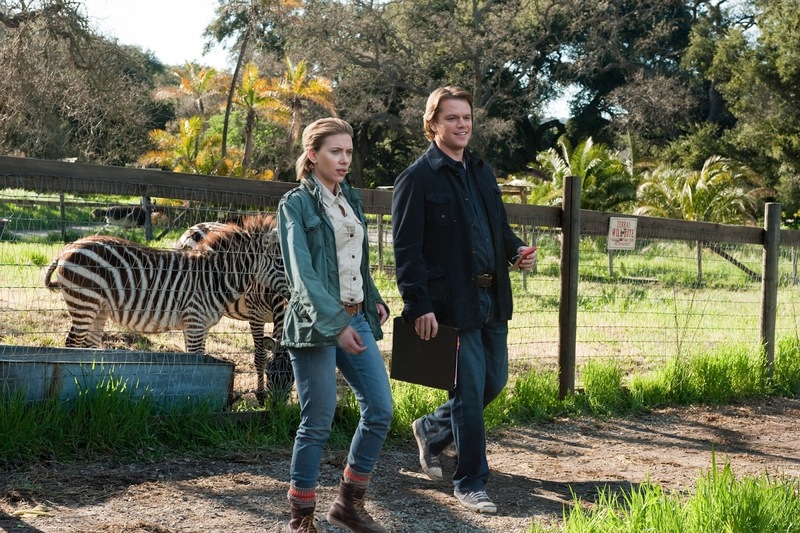 From Rotten Tomatoes (from the official movie site): "This holiday season, acclaimed filmmaker Cameron Crowe (Jerry Maguire, Almost Famous) directs an amazing and true story about a single dad who decides his family needs a fresh start, so he and his two children move to the most unlikely of places: a zoo. With the help of an eclectic staff, and with many misadventures along the way, the family works to return the dilapidated zoo to its former wonder and glory." 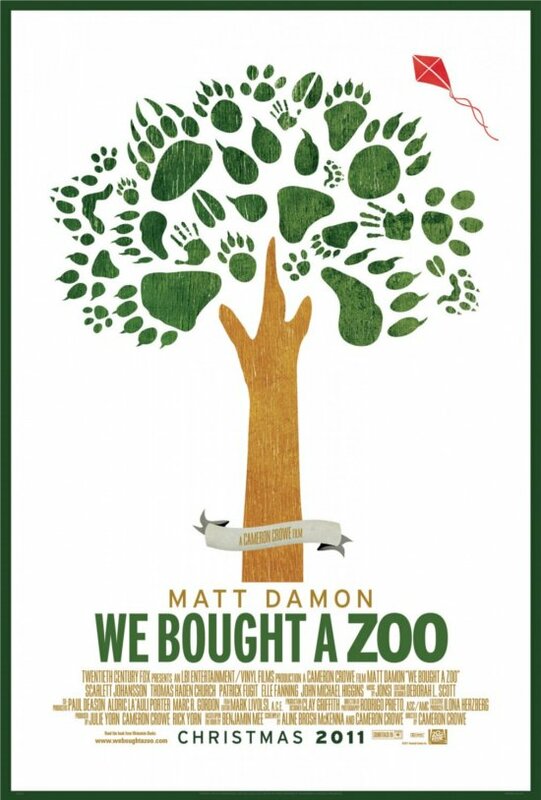 Matt Damon is quite charming in this film. For those of you familiar with his work in Good Will Hunting and the Bourne Trilogy you will see here how he has evolved as an actor. Damon has always been razor sharp, but there's a sublime awkwardness to his Benjamin Mee that is so disarming and real, not dissimilar to the "everyman" widowed father he portrayed earlier this year in Soderbergh's Contagion. As a journalist, Benjamin Mee made his living from knowing the right words to say. He found himself in unfamiliar territory with words, when as a widower, he struggled to find the right words to reach his son, Dylan (Colin Ford). Buying a house with a zoo in its backyard begins as an adventure into a new life that becomes a journey toward self-discovery and healing. While Scarlett Johansson is an adequate love interest for Damon and Maggie Elizabeth Jones (Rosie Mee, Ben's daughter) is about as adorable as they come, it's Thomas Hayden Church (Duncan Mee) and Colin Ford that really steal the show with their comedic and dramatic portrayals of Benjamin's brother and son. This story is one of the "feel good movies" of last year aided by a fantastic soundtrack featuring many songs from jonsi of Siger Ros. Cameron Crowe is a true genius to make the soundtrack become another character in his movies. Take "Say Anything" (Peter Gabriel's In Your Eyes) and "Almost Famous" (Elton John's Tiny Dancer) to name a few? 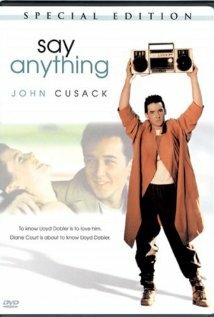 Gabriel's single from Say Anything re-entered the US Top 40 three years after its release, due solely to that iconic scene with John Cusack, boombox raised high above his head. If we're lucky, we just might see a live performance of "Gathering Stories" (jonsi) on Oscar night if the buzz for best song is true...it's already picked up the Satellite Award from the International Press Academy and the Awards season is very young. I guess we'll know Jan. 24 when the nominations come out. As for the film, The Artist gives it 4 Paint Brushes and not having seen it myself, I feel confident that I can recommend it for some good family fun that also hits some very tender beats while remaining a wholly uplifting film. From IMDB: "In the bleak days of the Cold War, espionage veteran George Smiley is forced from semi-retirement to uncover a Soviet agent within MI6's echelons." This film has received high praise (85% on RT, 7.6 on IMDB, 85 on Metacritic). There's my review...a bunch of other people liked, so you should too. No, I haven't grown that shallow in my old age, but I will keep my remarks brief. My take: I liked it. I was blown away the way I expected and at times I thought that for a complex spy thriller, it may have been just a pinch too complex. 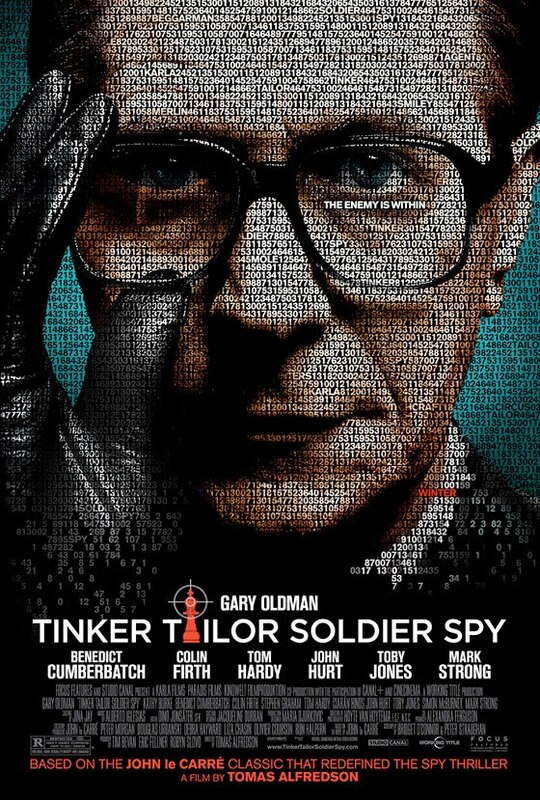 But what a cast and what a performance by Gary Oldman! It's no lie...he will be a front runner for the Oscar and his supporting cast is stellar as well. He shares some screen time for the first of at least two times this year, with The Dark Knight Rises featuring each later this year. TTSS is an enjoyable movie...but I think I will like DKR a tad bit more, or at least that's what I'm expecting. 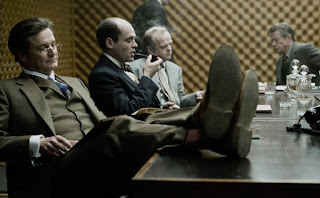 Also featured are William Hurt, Toby Jones, Ciarian Hinds, Colin Firth, and Marc Strong. Strong used to be what I considered the poor man's Andy Garcia...the tables have turned. Strong is a chameleon that can take any role and devour it. 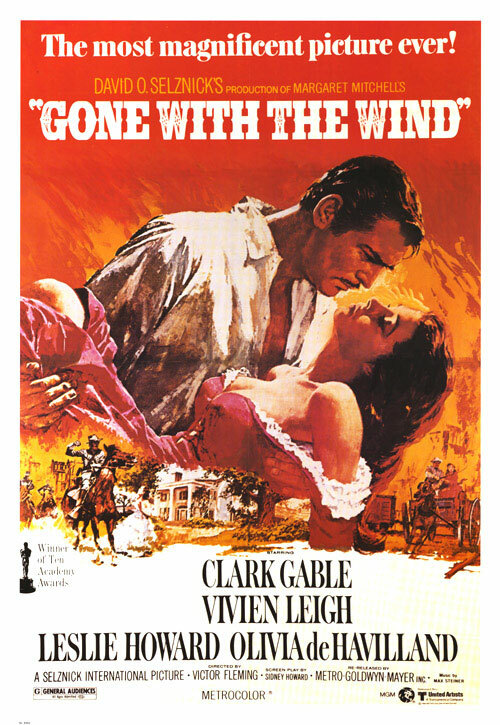 Truly, this movie is carried by the performances and the filmmaking. 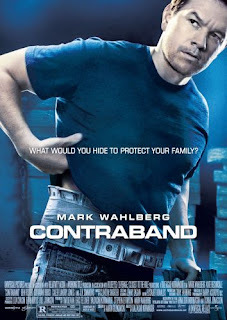 With a lesser cast and lesser filmmakers, this wouldn't have been nearly the film it was....no duh, Rhino! I'm just saying, I think that this film has a lot going for it when when the story was resolved, I stood in awe of the film but not the story. If you haven’t also seen one of director Tomas Alfredson’s earlier pictures, Let the Right One In, the Swedish vampire flick, do it. Please steer clear of Let Me In, the Americanized re-make, and stick with Sweden. See Tinker, Tailor, Soldier, Spy… I recommend it wholeheartedly and give it a 4 of 5 Horn rating. I have very narrow reservations, but it’s 9 to 1 in favor of the good.